This NASA chart shows the shadow path of the "ring of fire" annular solar eclipse of April 28-29, 2014. The chart, prepared by NASA eclipse expert Fred Espenak, also lists times for the maximum eclipse, as well as start and stop times. 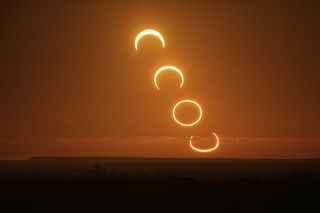 The annular solar eclipse of April 29, 2014 will only be total in a small area in Antarctica, but will be widely seen as a partial eclipse. The partial phases all be visible from most of Australia, and far across the southern Indian Ocean. It is seen here from Hobart, Tasmania.